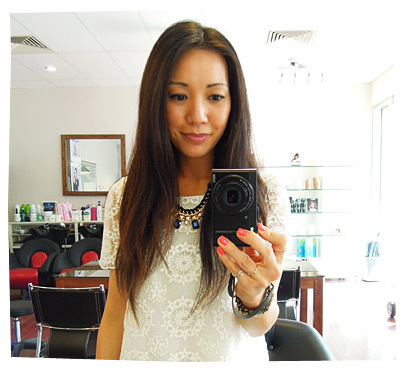 Early last week, I contacted a new Korean hair salon in Perth because… I wanted a balayage and a PERM!! 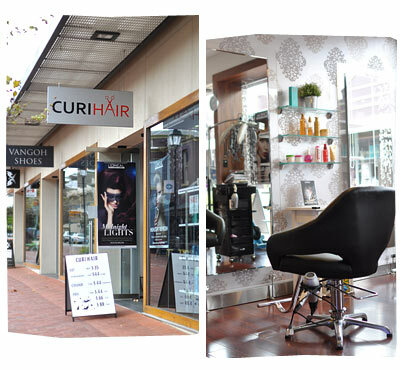 The salon I contacted is called Curi Hair and it was recommended to me by the owner of Vangoh Shoes (which I blogged about a few weeks ago), Vanessa. She had a killer balayage and I asked her where she got it done. She said she went to a new salon next to her Subiaco store (can you see the Vangoh shoe store in the background? )… and it was a done deal – I have always wanted to try a Korean hair salon and I always prefer to go to places with a word of mouth recommendation! Curi Hair opened about 3 months ago, by husband and wife team, Jay and Tiffany. I must admit, I was a little afraid that the owners didn’t speak much English and that I would have trouble communicating with them. But it turns out that Jay and Tiffany had been living in Sydney and then Perth for about 7 years, and working in hair salons all over Australia. Prior to that, they had been living in Canada and of course Korea. They both have up to 15 years of hair dressing experience, they knew all the names of the local salons that I had tried out over the years, and they even assisted backstage at past Australian fashion festivals. It all made me feel confident that they were professional, had loads of experience, savvy with trendy styles, up-to-date with modern hairdressing news and technology etc. Plus they were just lovely, friendly and so warm to chat to. Ok so I told them what I wanted – a balayage and a perm. But they said that a perm can be very drying for hair, so it’s best to have a perm first THEN do a balayage a few weeks later. The professionals know best, so I was fine with that. 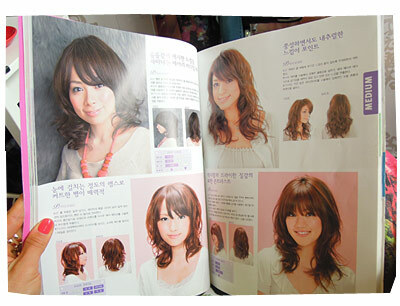 I flipped through a hair style book and found what I wanted. See that hair model in the front, wearing red? BINGO ! I wanted tight-ish curls, no fringe. So this is my BEFORE photo. I had a gorgeous balayage done 1 year ago… and I haven’t had a hair cut in 6 months. I often colour my own hair using home hair dye to keep my lighter bits vibrant. I have been itching to have another balayage (for a few months now), as I want my ends to be lighter for summer. OK so first up, I had a hair cut (left). 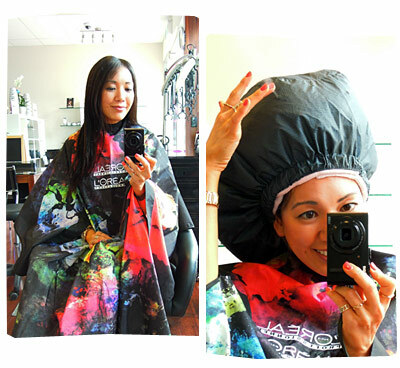 Then they gave me a hair treatment which involved putting a steam cap over my hair for about 20 minutes. The whole thing ballooned around my head as steam was gently pumped into the cap. There were a few air holes in the cap and steam was shooting out (pictured right)… it looked pretty comical and I felt like a kettle. I actually can’t recall the exact order of treatment! 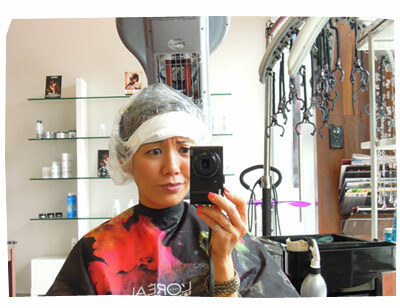 I think they then put the perm agent into my hair, covered it with a shower cap and then warmed it up with a rotating warming machine (pictured above) for another 20 minutes or so. 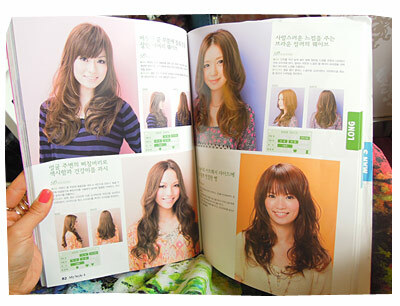 While I was waiting, I flipped through the hair style book again… swooning at all the pretty perms. 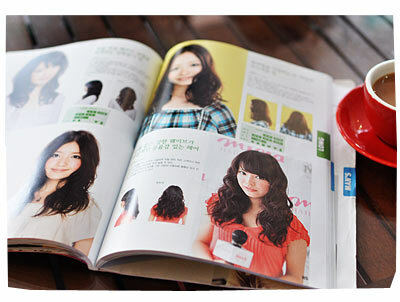 This is an example page for medium length hair. And another example page for long hair. Ceramic rollers were rolled onto my hair. Then little clamps (that look like robot hands) were clipped onto the rollers… which kept the rollers heated at a constant temperature. It looked like some crazy science-fiction, alien robot!! They told me that this machine (and most of their equipment) are imported from Korea. 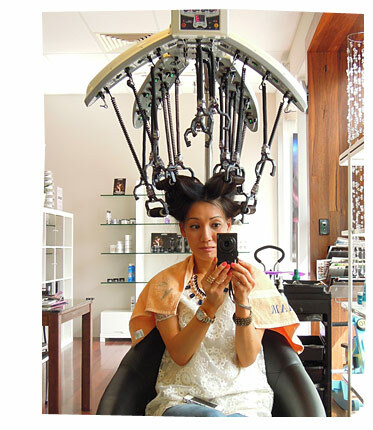 Regular salons in Australia don’t have this kind of machine… because Anglo-Australians have a very different hair texture to Asians. After another long wait, they took the clips and rollers off my hair. They washed my hair AGAIN and put another “neutralising treatment” into my hair (I think?). They towel-dried my hair. Put in some hair oil. They blow dried my hair, with lots of twisting and twirling. A bit more serum and BEHOLD! Ooooooh I was so happy with the result!! Apparently the curls can last up to 6 to 12 months!! Over time the curls will get looser and softer. The curls look really natural – and not at all like the AUNTY perms of the 80s! This kind of perm technique is called a “Setting Perm”. It’s similar to a “Digital Perm” which just uses a different machine. The whole hair experience was supposed to take about 2-3 hours. But it took me 4 hours, because I took lots of photos, talked to Tiffany and Jay a lot, I went out for a toilet break, and I also had to move my car (I parked in a 2 hours parking zone!) and I also stopped to buy myself some sushi for lunch haha. This photo is me ONE WEEK later, having brunch with my friend Randall. I was supposed to: towel dry my hair, apply hair oil, then twist and twirl sections of hair into little ringlets… then blow dry the ringlets to help them keep their shape. But I was in a huge rush and I just did a LAZY BLOW DRY, blasting hot air in all directions until it was all dry haha (sorry Tiffany!). But hey this is real life and who’s got time for glamorous hair everyday? I applied some hair oil and smoothing cream. I actually love, love, LOVE these soft, bouncy “everyday” curls. As for creating *glamour* curls (like when I first stepped out of the salon)… I still need a bit of practice to get my curls tighter, more defined and less frizzy. I’ve also noticed that I have a lot of frizziness, which I never used to have. All my naturally curly-haired friends just laughed and said that was TOTALLY normal for curly hair… and I should just invest in a good hair oil. I’m definitely coming back for my balayage soon! Can’t wait! The price for a setting perm starts at $180, and it goes up a *little* if you have super long hair. Balayage starts at $135, and goes up a little bit if you have super long and thick hair. They don’t have a website yet, but they have a Curi Hair Facebook Page. 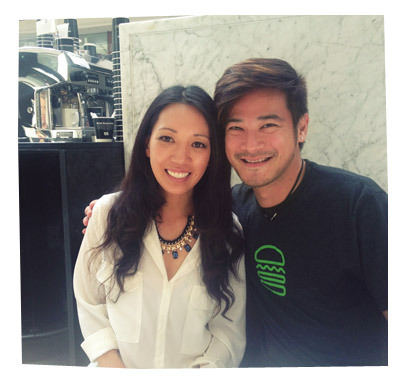 A big thank you to Jay and Tiffany!